Members of President Trump’s evangelical advisory council decided to jump ship for the day and publicly sided with Nancy Pelosi on DACA. “You have always taken the lead. Your commitment to the immigrant community to the dreams is second to none. So America is in a better place because of your prophetic leadership on this matter,” the Rev. Samuel Rodriguez, who spoke at Trump’s inauguration last year, told Pelosi at a press conference on Thursday. 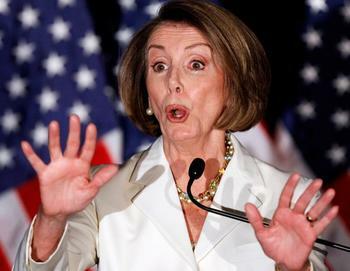 That’s a glowing review of Pelosi’s tenure. And an absolute rejection of what Trump ran on. We can see where this is heading. “We can’t continue to play politics with 800,000 human beings created in the image of God. It is morally reprehensible,” Rodriguez said. “If we have to build a wall in order to secure and save 800,000 lives, let’s make that happen as expeditiously as possible. Let’s cross the proverbial [River] Jordan of saving our DACA young men and women. Let’s do it now,” he continued.